Thinking about a Rhubarb Garden? Thinking of starting a Rhubarb Garden? Here, (scroll down), are pictures of my rhubarb plants during the growing season from early Spring to the first harvest. My rhubarb patch consists of mostly the Victoria variety of rhubarb as well as a few plants of other varieties. 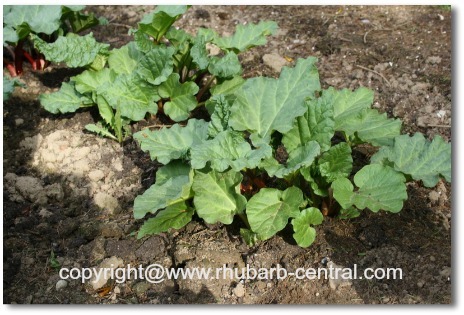 Rhubarb is so easy to grow, in fact I believe it is the easiest vegetable to grow ! Since rhubarb is a perennial, the rhubarb plants come up year after year, and require very little maintenance. Rhubarb is harvested two to three times a season and gives a very large yield that can be used fresh, and the excess rhubarb can very easily be frozen or canned. In addition to being the easiest vegetable to grow, I believe that rhubarb is also the most versatile vegetable to grow. "Treated" like a fruit it can be baked into pies, muffins, breads, cookies, tarts and cakes. It can be included in salads, ice cream, smoothies, drinks, sauces, jams, and soup. There are also recipes for including rhubarb in dinner menus to accompany beef, pork, lamb, chicken and fish. Take a look at the navigation bars to the left of this page (or scroll down for mobile view), and I am sure you will be amazed at all the possibilities rhubarb recipes have to offer! 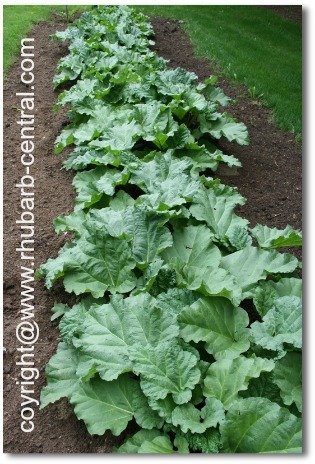 Below are rhubarb plants available for online purchase at *Amazon.com. So, if you are, up until now, not sure if YOU should grow rhubarb, let me assure you, that I believe you would be very happy with your decision! Growing Rhubarb is FUN, EASY and FRUGAL! This picture (above) is of my rhubarb patch in early Spring. 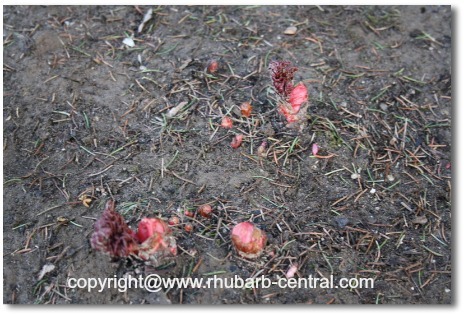 You can see the rhubarb starting to "peek" out from the ground. 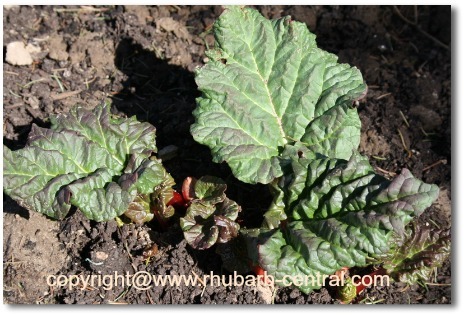 In this picture (above) you can see that the rhubarb plants are growing nicely in Spring. 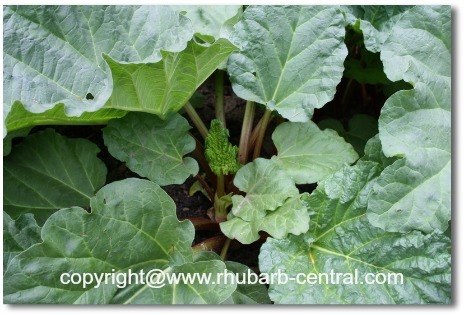 The rhubarb plants are close to being ready for harvesting. Rhubarb Plants are Ready to Harvest! It is now mid-May and the rhubarb is ready to be harvested/picked. Note that there are some stalks and leaves that are just emerging. The very young stalks will be picked after they have matured - at the time of the next harvest. Not all the leaves and stalks need to be harvested at once, I usually pick the rhubarb patch two or three times a year.